The FiberTread mat is a 20' roll mat, streamlined to provide you with top-notch properties for your most important industrial matting needs. 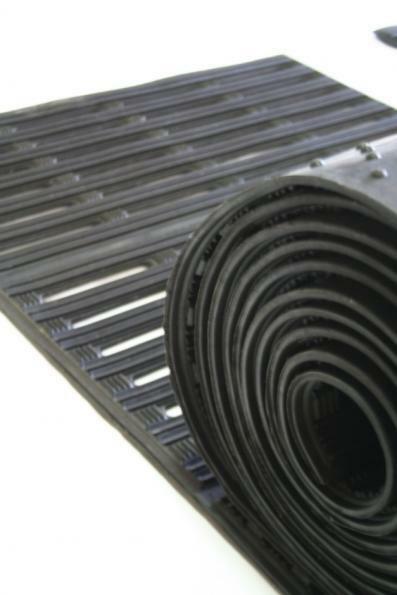 Offering you 3 widths in both open and closed designs, this mat should be more than adequate for an application! Manufactured with SBR/NR Fiber-reinforced rubber compound, with added polymers to aid in non-staining, non-marking qualities, it will help keep your floors clean. The fiber-reinforcment adds strength and durability, making this mat ideal for welding, machining and heavy assembly areas. 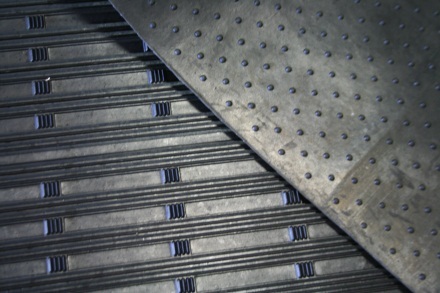 Forklifts and handcarts are no match for this great product, designating it an ideal choice for grating and catwalks. The multi-directional design provides an added safety feature which aids in traction and also ensures that the ends will not curl. The open design allows for particles and fluids to easily escape, while the underside has raised knobs which allow airflow under the mat for ergonomic comfort. 24" x 20' x 1/2" [W x L x H] Solid88 lbs. 24" x 20' x 1/2" [W x L x H] Drain 81 lbs. 36" x 20' x 1/2" [W x L x H] Solid 132 lbs. 36" x 20' x 1/2" [W x L x H] Drain123 lbs. 48" x 20' x 1/2" [W x L x H] Solid 176 lbs. 48" x 20' x 1/2" [W x L x H] Drain165 lbs. Grease resistant by special request. Non-fiber reinforced by special request.